Armchair Fiction presents extra-large editions of classic science fiction double novels with original illustrations. The first novel, “The Exile of the Skies” is a grand epic of space opera by Richard Vaughan. He was an outcast in the endless abyss of space. Knute Savary thought he was saving Earth, but the rest of the world didn’t see it that way. And when Savary’s master plan went awry, resulting in the deaths of thousands of his fellow Earthmen, the world struck back, toppling his plans for the restoration of Earth’s atmosphere and casting him into the infinite void, never to return. But instead of dying of loneliness in the vast chasm of outer space, Savary found new life, new adventure, and new meaning. Bounding from one distant planet to another, Savary and his co-pilot collided with a myriad of alien creatures—small and large, benevolent and cruel, benign and monstrous. And eventually, with newfound knowledge and newfound purpose, Savary was given a possible path to redemption. The only question was…would he take it? 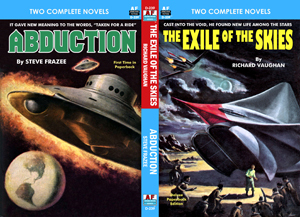 The second novel is “Abduction” by Steve Frazee What would you do if you were abducted by a flying saucer and no one in town believed you? What would you do if telling your story cost you your job, your family, and quite possibly…your life. A local beat reporter, a seasoned Army Air Force Investigator, and a tough local businessman look to get to the bottom of a tantalizing mystery that has shrouded the small town of Gravel Ford in mayhem and controversy. And for Johnny Rogers and his wife Betty, a series of mysterious circumstances soon put their life into an uproar and sent them tumbling into one of the most intriguing UFO abduction tales ever told.